Dance foot injury: why do i have pain pointing my foot? Dance Foot Injury : Pain pointing my foot ? Why do I have pain pointing my foot? Why do I have trouble/pain when stretching my ankle? Podiatrists call this condition Posterior impingement, which is a condition where the soft tissues within the foot become pinched between back lip of the tibia (the main leg bone) and the talus (the deep ankle bone) during extreme stretching/pointing of the ankle. In some cases, the back portion of the talus bone is enlarged by a spurred collar of bone or there is an extra bone in this location. 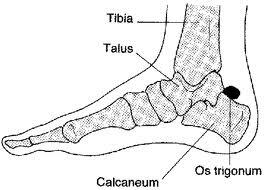 This extra bone is an accessory bone called Os Trigonum which is like a little bony pebble sitting within the soft tissue and it can cause a physical blockade as the ankle moves through its full range of motion. Inflammation of the soft tissues further reduces the amount of motion available. Treatment involves rest and icing to reduce inflammation. In severe cases, surgical removal of Os Trigonum may be necessary and can usually be achieved by keyhole surgery / arthroscopy.